For Elders With Dementia, Musical Awakenings Social worker Dan Cohen works in nursing homes, hoping to transform the lives of residents — especially those experiencing dementia — by giving them iPods full of their favorite music. Joe, a nursing home resident, broke into song during a personalized music session. His story and others are documented in the film Alive Inside. Henry, an elderly Alzheimer's patient in an American nursing home, recently became a viral star. In a short video that has been viewed millions of times online, he starts out slumped over and unresponsive — but undergoes a remarkable transformation as he listens to music on a pair of headphones. 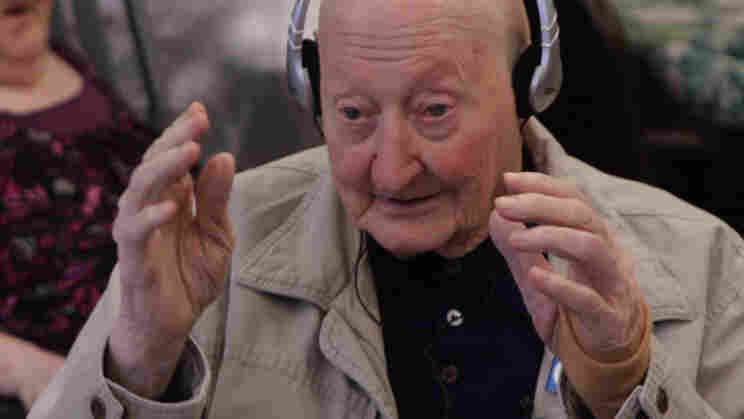 The clip is part of a documentary called Alive Inside, which follows social worker Dan Cohen as he creates personalized iPod playlists for people in elder care facilities, hoping to reconnect them with the music they love. Cohen tells NPR's Melissa Block that the video of Henry is a great example of the link between music and memory. "He is able to actually answer questions and speak about his youth, and this is sort of the magic of music that's familiar for those with dementia," Cohen says. "Even though Alzheimer's and various forms of dementia will ravage many parts of the brain, long-term memory of music from when one was young remains very often. So if you tap that, you really get that kind of awakening response. It's pretty exciting to see." Cohen says his goal is to make access to personalized music the standard of care at nursing facilities. An early concern, he says, was that headphones might isolate the patients even further. But when he first implemented the project on a large scale in 2008, putting 200 iPods in four facilities around New York, he got the opposite result: a flood of stories from the staff about increased socialization. "People wanted to share their music with others: 'Here, you've gotta listen to this,' or 'What was the name of that song?' " Cohen says. "The music is great, but to me, perhaps the even bigger win is people having better and more relationships with those around them." Get the playlist right. Find out the person's tastes and create a varied mix: no more than five to seven songs per artist. Have them weed out tracks that are so-so, so you end up with 100 or 200 songs that all resonate. Keep it simple. Make sure the elder knows how to use the player, or that someone nearby can help. Use over-ear headphones rather than earbuds, which can fall out. Be patient. It can take time to reach the music memory. If the person is responding, feel free to sing along. If someone doesn't like the headphones, try a small speaker at first and incorporate the headphones gradually over time. Keep it special. Don't leave the player on all the time. Nursing homes are finding it works well during transitions: If someone is hesitant to take a bath or eat or get dressed, music may help move things along. Cohen admits that the realities of funding and staffing mean that not all nursing homes will have the appetite for this level of individualized care. However, he points out that the pace of technological advancement is making iPods cheaper and easier to round up. "My goal has been to find ways of bringing the cost down to zero," he says. "Since there have been so many generations of new digital devices that come fast and furious, we have the old iPods — many of us in our drawers at home — so let's bring them in. On Long Island, there are five school districts that are running iPod donation drives." Cohen says that, ultimately, the project is about helping people remember who they are. "When you leave your home, you leave your family, you leave your surroundings and you go into a new environment; it's tough," he says. "So anything that you can maintain or stay connected with that relates to you [is helpful]. And what's more core to your being than music?" Alive Inside screens April 18, 20 and 21 at the Rubin Museum in New York City. You can learn more, and see additional clips from the film, at the Music & Memory website.